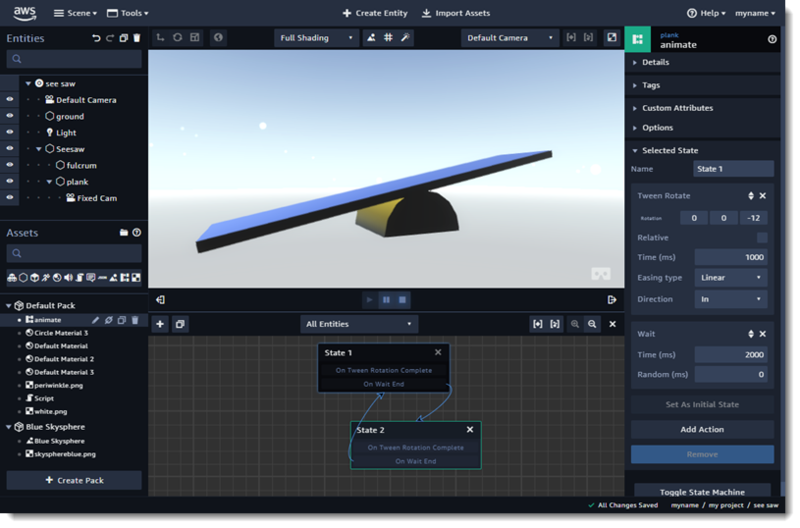 The Sumerian editor provides an interface for easily importing assets, building a scene, and publishing the scene on the internet. When you load a scene in the Sumerian editor, you can see a menu bar at the top of the screen, the entities panel, the assets panel, the canvas, and the inspector panel. This menu bar provides menus for navigating between scenes, accessing tools, and publishing. Sumerian logo– Exit to dashboard. Scene – Create a new scene, publish your scene, or open a recent scene. Tools – Access the text editor, behavior editor, and timeline editor. Create entity – Add a shape, light, camera, or blank entity to the scene. Import assets – Open the asset library. Help – View the shortcut list or submit feedback. The status bar at the bottom of the screen shows updates about save, import, and rendering operations. Progress bar – Shows information about the current activity, such as model uploading. Path – The current user, project, and scene. The following topics describe the menu options in each of the areas of the editor.